A browser supporting CSP ignores code that is not in the whitelist. Browsers who do not support CSP ignore the policy. CSP is currently only supported by Firefox 4, Thunderbird 3.3 and SeaMonkey 2.1. You can test the functionality by visiting this test page. 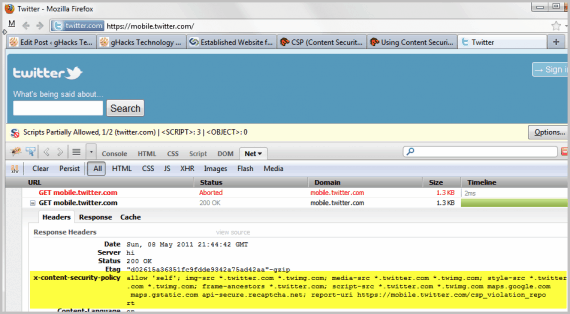 Twitter recently announced that they have added CSP to their mobile version, accessible under mobile.twitter.com. Users who use one of the aforementioned browsers are protected from XSS attacks on that website. They managed to resolve those problems by mandating SSL for all Firefox 4 users who access the mobile Twitter web site. A test with Firebug shows that the mobile version of Twitter is indeed using the policy on site. Please note that Twitter makes a user agent check and is very restrictive about it. Firefox 5 or Firefox 6 users won’t get the policy currently. The using CSP guide on Mozilla offers additional examples on how to set the right headers. Browsers that do not support CSP ignore the header. CSP offers two additional forms of protection. It mitigates clickjacking attacks. Clickjacking refers to directing a user’s mouse click to a target on another site. This is often done by using transparent frames on the original website. Content Security Policy can also be used to mitigate packet sniffing attacks, as it allows the webmaster to specific protocols that are allowed to be used. It is for instance possible to force HTTPS only connections. The CSP Policy directives are accessible here on Mozilla. Next to the already mentioned options are parameters to specific hosts where images, media files, objects or fonts may be loaded from. Plugins are available for WordPress and Drupal that add the policy to supported websites automatically when activated.